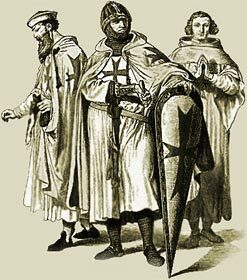 The guilds in Medieval Times were an important part of Medieval life. A higher social status could be achieved through membership to Craft guilds. There were two main kinds of Medieval guilds - Merchant Guilds and Craft Guilds. The word “guild” is from the Saxon “gilden” meaning "to pay" and refers to the subscription paid to the Guilds by their members. For a more detailed list of the names of the Craft Guilds click the link Medieval London Guilds. The Craft Guilds, like the Merchant Guilds, formed organizations for protection and mutual aid. Soon no one within a Medieval town or city in Medieval Times could practice a craft or trade without belonging to the appropriate Merchant or Craft guild association. The Craft Guilds ensured that their members had similar rules to the Merchant Guilds. The Craft Guilds ensured that their craft or trade effectively became a 'closed shop' or monopoly preventing any outside competition. Prices were fixed between members of the Craft Guilds. And the Craft Guilds ensured that high standards of quality were maintained. The number of Craft Guild members were also regulated, allowing a restricted membership in order to ensure that the numbers of Craft Guilds did not exceed the business requirements. As time went by the Craft Guilds became as important in the Medieval towns and cities as the Merchant Guilds and the members of the Craft Guilds demanded that they also shared in civic duties and leadership. A man would have to work through three phases to become a member of a Medieval Craft Guild during the Medieval times and era. The Medieval Times website provides interesting facts, history and information about these great people and important historical events which scatter the Medieval History books including Medieval Craft Guilds. The Medieval Times Sitemap provides full details of all of the information and facts about the fascinating subject of the lives of the people who lived during the historical period of the Middle Ages. The content of this article on Medieval life and times provides free educational details, facts and information for reference and research for schools, colleges and homework for history courses and history coursework.